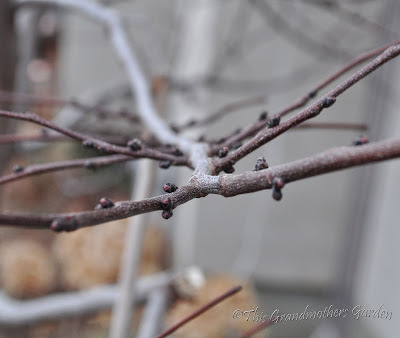 This Grandmother's Garden: Let the Swelling Begin! The air is crisp and cold, tiny specks of moisture skip across my face as I walk through my gardens. I'm on a hunt... a hunt for something Spring. 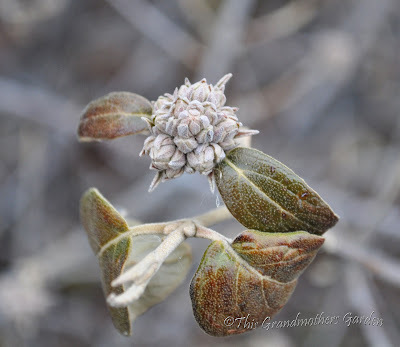 I've long since discovered that in my Utah gardens there is always a 'tug of war' between Winter and Spring. Old Man Winter longs to linger but the lovely Maiden Spring is intent to show her sunny face. So, back and forth they go, sometimes for weeks, until Old Man Winter finally gives in and the lovely Maiden Spring is declared the winner. We are in the midst of that "tug of war' now. More snow will fall in my gardens tonight as another storm approaches, but it will quickly melt as Spring has her way. This 'tug of war' is among our first signs that Spring is coming. Let the Bud Swelling Begin! Their pinkish-white flowers are among the first blooms of Spring. Their gardenia like fragrance will fill the air. This upright shrub is semi-evergreen most years in my gardens. This year our viburnums have been a bit challenged due to the prolonged below freezing temps. We need a little sunshine here. This is the hardiest redbud in my Utah garden. but Oklahoma endures the cold Winters and hot Summers so much better. 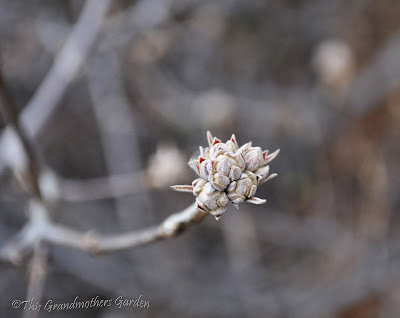 Those little buds are the flower buds. Enticed by the warmth of the sun, they will pop into a stunning display of tiny purple blossoms. But first, we will need a little sunshine. 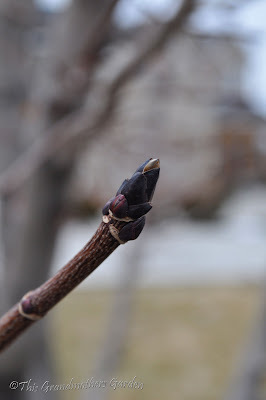 The tip of this bud shows the emergence of a new leaf. I've been watching these trees for several weeks and am thrilled to see this change. so we tend to celebrate tiny steps toward Spring. Tulip bulbs planted last Fall are just beginning to awake. I planted 200 of them. 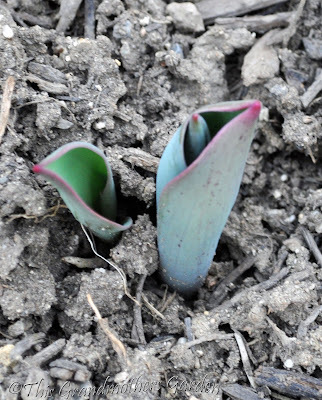 These are among the first to peek out from the beneath the soil. Yes, we could use a little more sunshine here as well. Old Man Winter is such a tease. 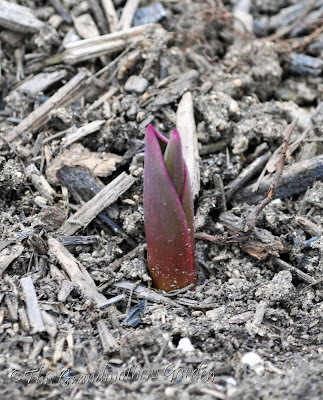 How lovely to see the fresh life emerging from the cold earth! It will be exciting to see your buds begin to swell Carolyn. I must wait a bit longer now. You have a poetic way with words. Your snow is gone and ours is still coming. The tulips are still cozy below and the buds terribly tight. At least you have found some promise on your hunt. I was just looking down at my feet and thinking the EXACT same thing! ;) Beautiful Pics! Things are a bloomin here in TX! 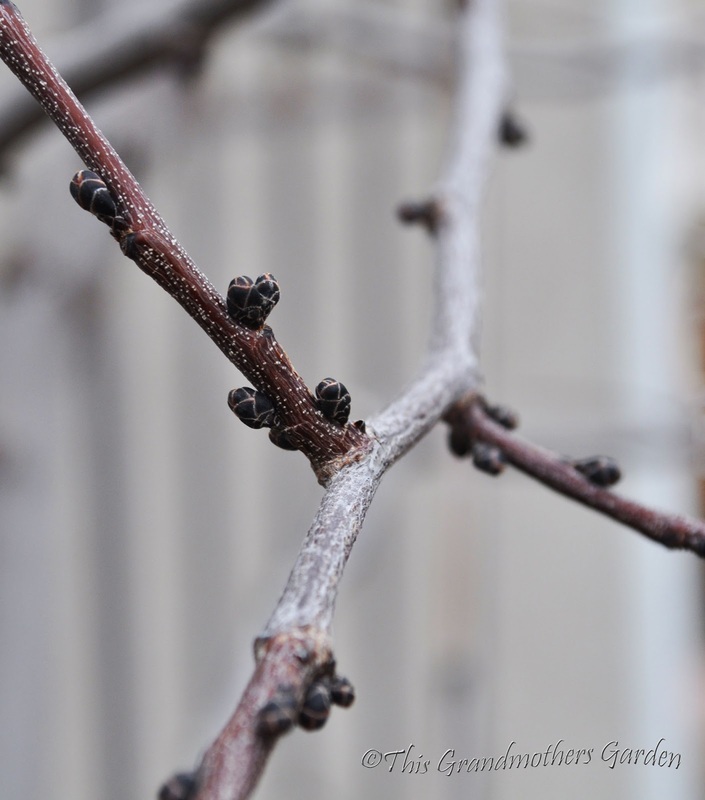 Oh, don't you just love this time of year when tiny buds are popping all over the place?? I know it's still a long time until our flowers are actually blooming but tree buds always give me hope. 200 hundred tulips?! I can't wait! Yay! Winter is on its way out... I am in awe of anyone who plants over 200 tulips. Yes, let the swelling begin!